Farm to Table Brunch. 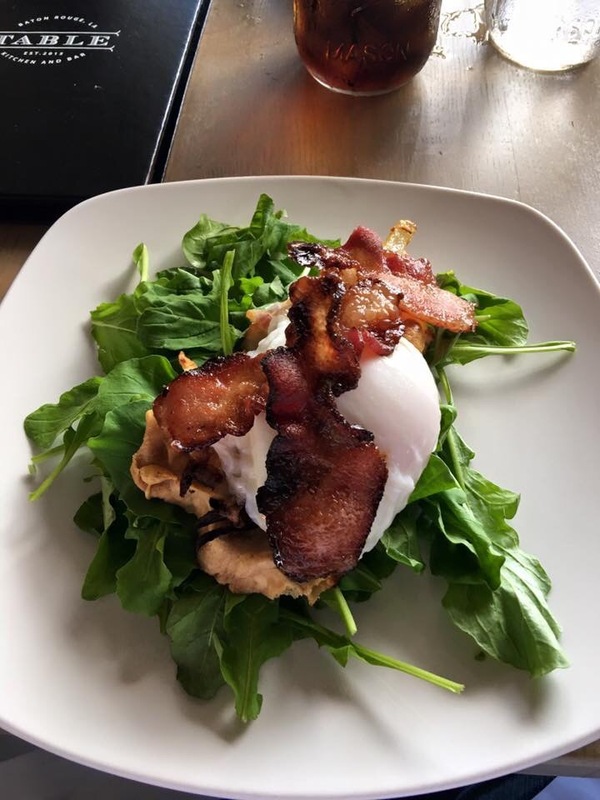 That’s how we would describe the Table Kitchen and Bar Sunday Brunch experience, with earthy tones and ambiance, comfortable climate controlled outside patio, mason jars for drinks, and, of course, noticeable fresh organic presentation, tastes, and flavors. This is a great brunch with a good selection and reasonable pricing. 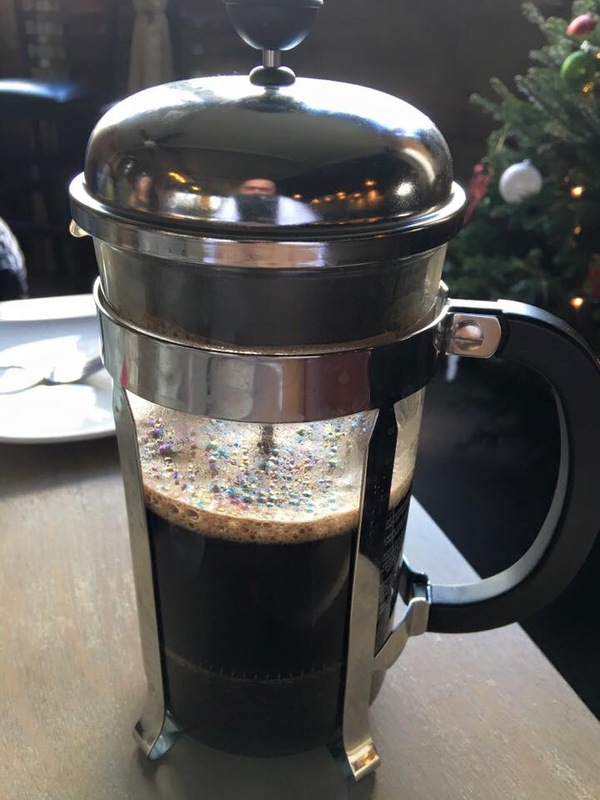 You can start your meal with fresh French roast pressed coffee brewed to order (dark or medium) at the table. 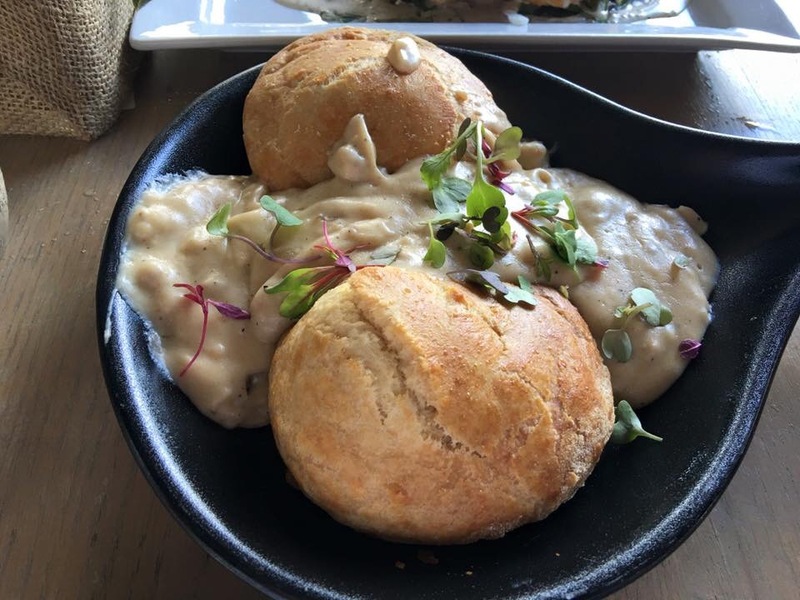 The butter milk biscuit with gravy appetizer is also a comfort food must! Perhaps one of the best breakfast biscuits in Baton Rouge (I know a bold statement–try them and prove me wrong). 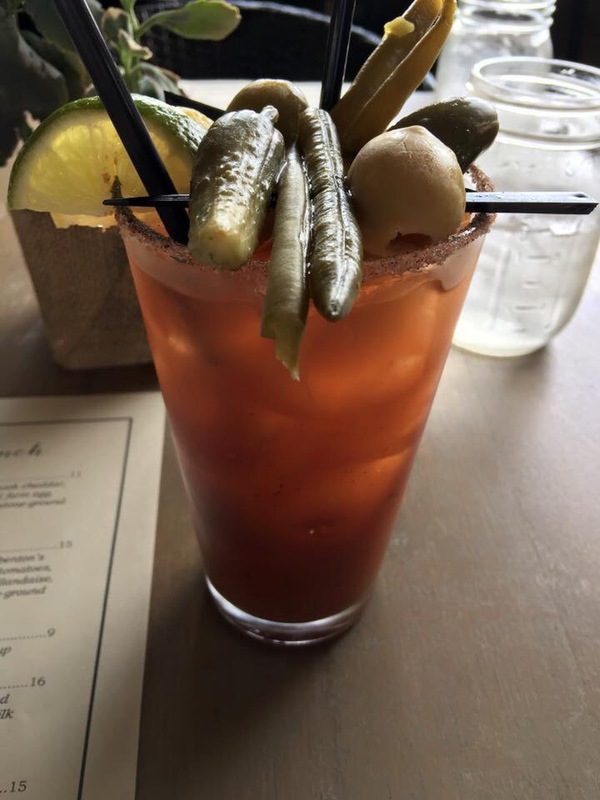 The house Bloody Mary is well foliaged with green beans, pickle, and olives–it has a great flavor and is delicious. Good mimosas. Also, ask for a Brandy Milk Punch, which is a nice off menu brunch beverage. There is lastly a wine selection if you would like to have a glass with your meal. We liked the Foodies California house cab. Good price point on all brunch beverages. For starters you also, in addition to the biscuits and gravy, need to try the Kohlrabi fritters. These fritters are a fresh lightly fried treat with a buttermilk dressing. They are light and not dense. Very flavorful, with fresh arugula and onion. Delicious. The brunch features a Tomato Pie with a perfect poached egg and an option to add bacon–trust me, add the bacon. Very organic feel and served with a side of grits, it was a great brunch item. A very nice play on a “at home kitchen” dish. This is another example of how the Table balances comfort food with sophistication. 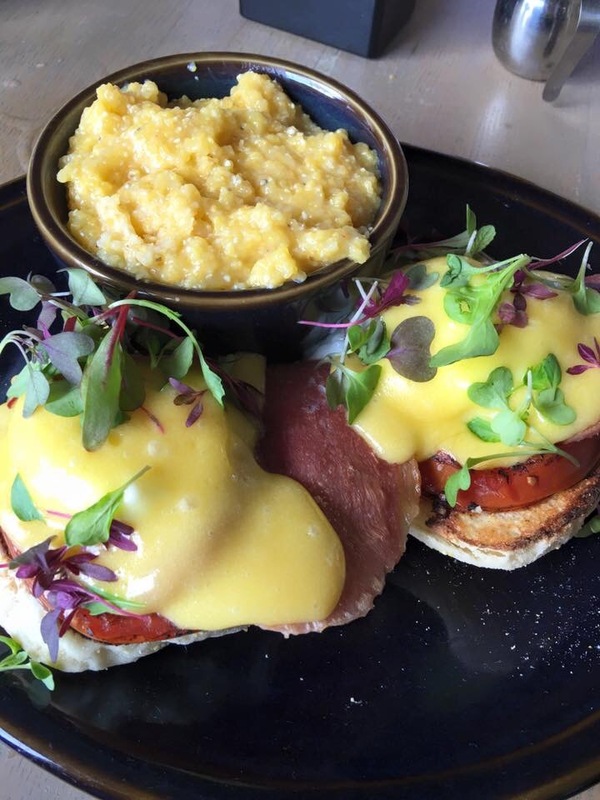 There is also an Eggs Benedict which features a lightly grilled tomato, perfect poached eggs, freshly made English muffins, a thick slice of ham with an appropriate amount of hollandaise sauce. The arugula garnish is a great “Table” twist of fresh farmer’s market taste. sauce is flavorful but not overpowering. 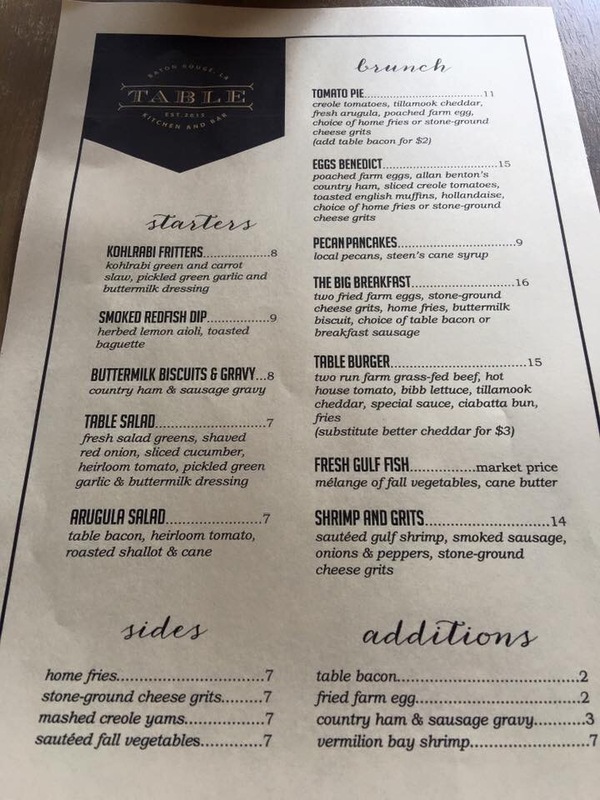 The grits felt a little underwhelming, more so having a feeling of flatness and were the only item on the menu that didn’t feel a hundred percent fresh. Could be a little more creamy, but overall a great dish! The Table Kitchen and Bar is a well titled place. 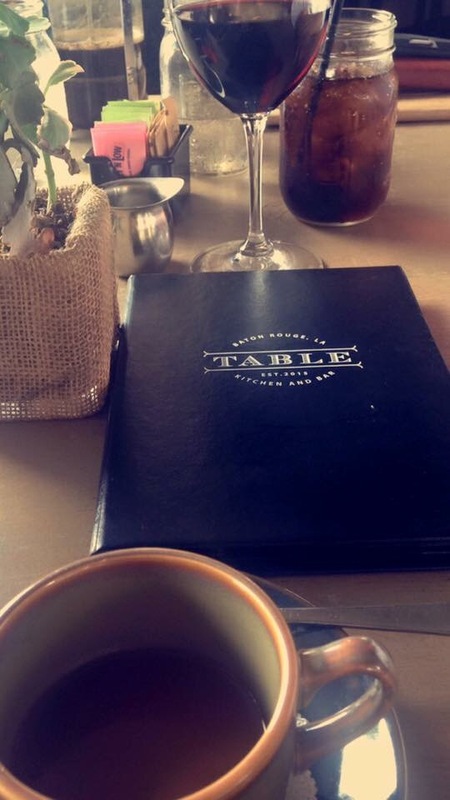 Farm to table brunch clearly done right! It’s a quiet environment where you feel like you are eating from a fresh kitchen whose ingredients were gathered at the market earlier in the day. Background music was peaceful, great decor, low lighting. The service was attentive and informative when asked about dishes. 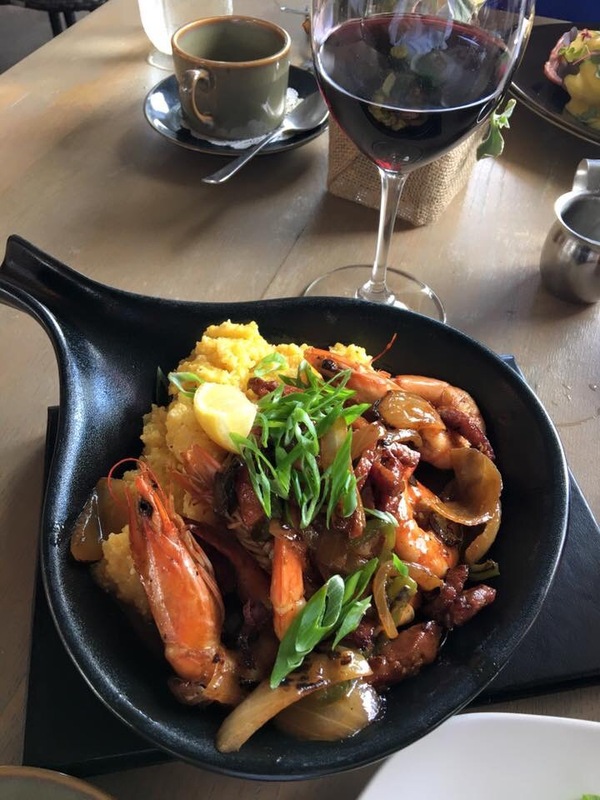 A great Baton Rouge Brunch for a well priced, family friendly, Sunday treat.